Android alarm clock docks are one of the most popular types of android docking stations. From my experience, an alarm dock is the perfect definition of a docking station, because most of the time your smartphone or tablet will sit docked on the station, while other type of docks, like speaker docks, we tend to use from a distance streaming music via Bluetooth and not actually docking our phones on the dock. There are multiple different features, both physical and digital to look at when purchasing an android alarm clock dock. We will look in more details of all these features and what you need to consider when purchasing an android alarm clock dock. 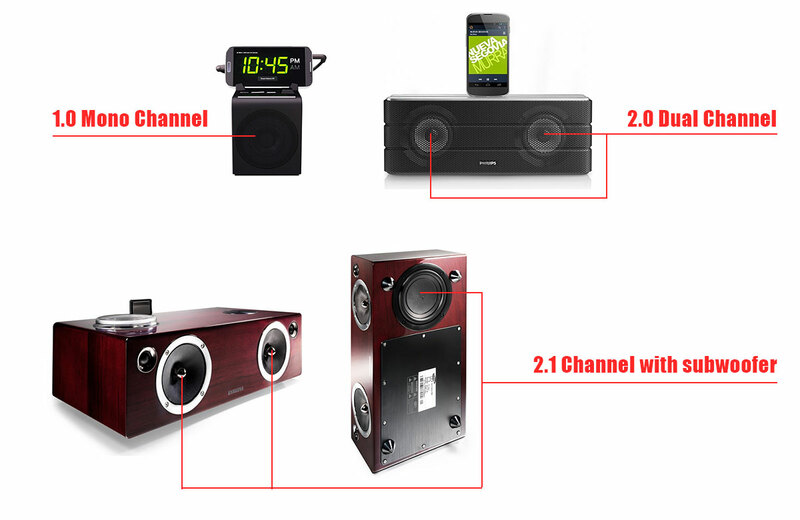 One of the main things you need to look at when purchasing an alarm dock are its speakers and music streaming options. The quality of speakers is an important factor to consider, unless you’ll be using the docking station just for charging and can put up with a regular beeping alarm signal that comes with most alarm clocks. However, if you want to wake up and fall asleep to your favorite songs or radio station and want to use the dock not only as alarm in mornings but also want to listen to music through the day or when you go to sleep at night, you must pay attention to the quality and power of the speakers. Most basic alarm clock docks will come with 1.0 channel or mono speakers with a single driver. 1.0 channel speakers are used in the most basic alarm docks, if you want to enjoy better quality sound with some level of bass, look for 2.0 channel docks that have two separate drivers or for a 2.1 channel docks that will also have a separate subwoofer and will produce much more level of bass. Bluetooth – Bluetooth is a wireless technology that allows transmitting music in approx. 30 meter range indoors. Bluetooth is the best option for those who will place the alarm clock dock away from their bed and do not always want to dock a smartphone or tablet into the docking station but still want an option to control the dock from a distance. Bluetooth gives you the freedom to control the alarm dock from a distance. 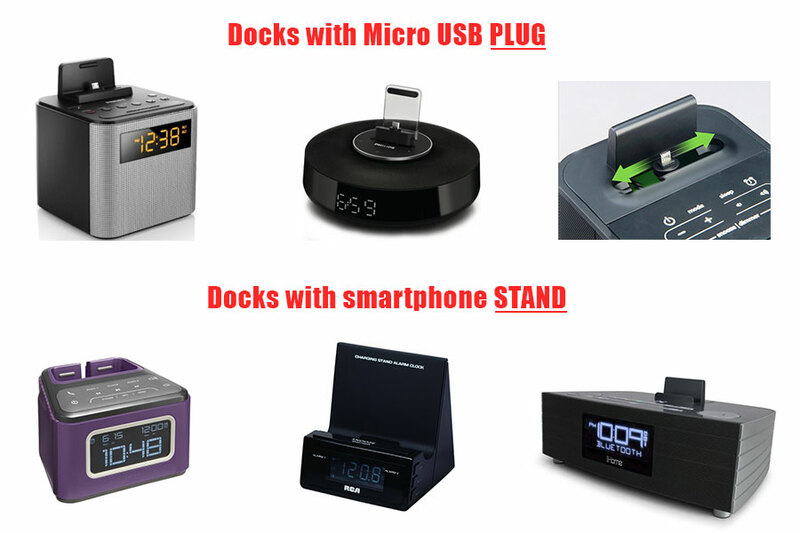 Disadvantage of the Bluetooth technology is that some Android devices and docking stations may face some problems with connection, such as smartphone can lose connection with the docking station and similar problems. 3.5mm AUX jack – Aux jack is more old school technology, which is not wireless and need a 3.5mm AUX cable to connect the docking station and a smartphone, tablet, mp3 player or other music device. Auxiliary connection will be better for those, who don’t want to use a Bluetooth connection for music streaming and prefer using the well-known 3.5mm jack. Aux jack will also allow connecting practically any device, as almost any smartphone, tablet and music player has a 3.5mm auxiliary input. However, you will not be able to transfer music from your phone to the docking station from a distance and your phone will always have to be connected into the alarm dock. Docking options may not be such an important factor for an alarm clock dock, but you still want to check if a docking station has a proper docking place for your smartphone or tablet. Most android alarm docks have a stand on top of the dock, where you can place single or multiple devices while they stream music to the docking station and usually allow charging single or multiple devices at a time. There are two more common docking types for alarm docks – Micro USB dock and Stand with additional charging ports. Micro USB dock allows docking a single android device on a Micro USB plug that usually is placed on the top of the unit. Most android dock manufacturers produce adjustable Micro USB stands, so you can dock practically any (most) Android phones. 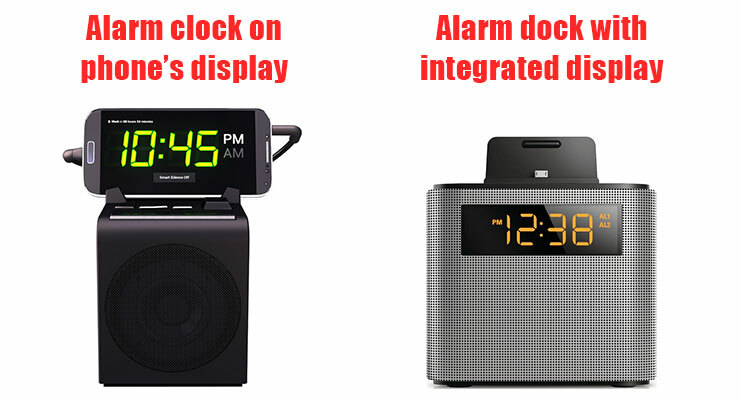 The other docking option has some sort of holder on top of the alarm clock dock, where you can simply place your smartphone and tablet, and connect them to the unit with an additional micro USB cable that can be plugged in the docking station for charging purposes. These docks sometimes come with a stand that can hold multiple devices at the same time and some can even hold a smartphone and a tablet at the same time. The drawback of such a docking option is that you need to use an additional cable for charging, which almost all times need to be bought separately. Also additional cables can become messy and will interfere with the simple looks of a docking station. Brightness – Check the brightness of the display, there are few thing to note here. First, check if display isn’t too dim and second, if display isn’t too bright. In both times there will be different problems. Dim displays are worse in the morning, as it may be difficult to see information on the display when it’s bright in the room if the display is too dim. If the display is too bright, it can interfere with your sleep at night, especially if it’s placed right next to the bed and shines on your bed all night. The best solution are alarm docks that automatically dim the screen at night, or alarm docks that have different dimmable settings and allow to manually dim the screen of the dock to a comfortable level. Clearly visible numbers also at night –A pretty common problem with alarm clock docks is brightness of the screen as well as the unsuccessfully selected fonts and very small numbers that make it difficult to see all the information at once, especially if you have just waken up in the middle of the night. Some dock manufacturers tend to put as much information as possible on the limited size screen of the dock, and in result it is very difficult to differentiate all this information in the middle of the night. Clock – Check if all numbers of the clock are clearly visible and illuminates in a dark, but not so much to disturb you at night. Dual alarm clock – This is a very useful feature if you and your partner wake up in separate times. You can set both alarms in different times with different tunes at different loudness, so you do not disturb or wake up each other in the morning. This feature is not that widely supported by android alarm docks and can be found in just few of the best alarm docks. Gradual wake and sleep – Gradual wake function is a lot more common and can be found in most alarm docks. It gradually increases the loudness of the alarm, giving you time to slowly wake up in the morning, and gradually decreases the volume of the sound at night, so you can fall asleep to your favorite music or radio stations. Call silencing – Another very useful feature supported just by few android docks and mostly comes as a feature of an application for certain docking station. This function silences calls and other sounds at night and you can customize what calls will and what won’t be silenced at night. Multiple alarm clocks – A lot of people like to set multiple alarm clocks in the morning so they don’t sleep their work, and also want to set various clocks for weekends and holidays. This function is also supported by most alarm docks. There are many android alarm docks and each has a special design that makes it more appealing in some interiors and less in others. Although not the most important aspect to check when selecting an alarm dock, but the design of the unit also must be considered before purchasing a dock. Besides the looks of the unit, the placement of buttons on the dock is also very important. Consider the place you will set the docking station and think if it’s going to be convenient to push the snooze, skip or repeat alarm buttons on the dock in the morning. The placement of the buttons on the dock is very important factor, especially if you need to quickly silence the alarm in the morning. Also check if buttons will be easy to locate in the dark. Android docks with glowing buttons can be batter seen at night, however check if the glow of the buttons is not too intrusive and do not disturb your night sleep. It is important to check if your smartphone or tablet integrates with the docking station. Integration means that settings from your smartphone can be understood by the alarm dock, so you just need to set an alarm on your smartphone and it will automatically sync with the docking station. Also other settings like wake up tunes, alarm repeating times and multiple alarm clocks will be used from your smartphone, so you won’t have to set separate alarm clock settings for the docking station. Built in radio – A very useful feature, if you don’t like using your smartphone’s radio, is a built in AM/FM radio. This feature can be found in many alarm clock docks. Speaker phone – Speaker phone allows taking calls through the speakers of the dock with a built in microphone. Useful feature if you’re using your alarm dock also for music listening in a day and don’t like to disconnect your smartphone from the dock each time someone calls you. NFC pairing – A technology implemented in the newest smartphones, docks and portable speakers that allows to instantly pair your Android smartphone or tablet that supports NFC technology with the docking station. Remote control – A very useful feature for docking stations that don’t support Bluetooth connection, which allows to control the docking station from a distance, even when your smartphone is docked in the station. Multi-device support – A useful feature if you own multiple Android devices or an Android and iOS device and want to dock both devices in the alarm clock dock simultaneously for charging and music playback. This feature is supported by some high-end android docking stations. If you often experience power outages in your house, you might want to think about buying an android alarm clock dock that can work on batteries. There are few alarm docks that offers this feature. It will also allow taking the alarm clock with you on the go and based on the size, power and capacity of the battery you may use it as a portable docking station. You may want to look for an android alarm clock dock that comes with an application on a Google Play store. Docks with android app support often provide more customizable alarm clock settings so you can adapt it for your needs. However, some manufacturers have not invested enough work into their apps and have developed some poor applications, which don’t support all android models, have bugs in them and don’t provide all the most useful alarm clock features. If alarm dock application is important to you, check the ratings and reviews of that application on the Google Play store before purchasing the dock.